If you’re a people watcher, observing skydivers preparing for hop and pop skydives (low-altitude exits) is a lot of fun. You see everything from cool-cat, ho-hum, highly experienced swoopers practicing their craft to jumpy first-timers doing their first exits below full altitude, hoping with all their hearts to be stable enough to deploy within the 5 seconds required to graduate from student status. Plan your exit order with any other hop and poppers before you board the plane. The person with the highest wing loading should exit first, since they will be descending more quickly. Knowing this before boarding lets you load the plane efficiently in the correct order so you don’t end up climbing over or around each other before exit, reducing the chance that you’ll snag pins, flaps, and handles in the plane (bad juju!). Remove your seat belt and ensure those jumpers near the door have their seat belts off as well. If there is an aircraft emergency and the pilot tells us to bail, we all want those jumpers to be able to exit as quickly as possible! Check the jumpers up closer to the pilot to make sure their belts are off too. Usually there will be an instructor or experienced jumper on board who will give you a thumbs up when all is clear. Check your handles and buckles, get a pin check, and secure any loose accessories (gloves, helmets, etc.) before opening the door.If you’re unfamiliar with operating the door of a Twin Otter or Caravan, please check out this video! Sit safely. Usually as a hop and popper, you’re sitting on the floor near the door and you may be tempted to lean on the wall, bulkhead, or the end of a bench. As with any ride to altitude, you should make sure you are not moving around a lot and especially not scrunching the back of your rig on things as this can pull or bend your pins (neither of which is good!). In particular, some aircraft have rails on the bulkheads that are at a perfect height to mess with your reserve pins if you are not careful, and the ends of Otter benches are a pretty good height for that too. Very experienced jumpers have pushed out their reserve pins on the ends of benches! You can safely lean straight back on things IF you are gentle and don’t move around a lot, but it’s even better to avoid that. Check the spot AND check for traffic. When the door (red) light goes on, do any of the above checks remaining and open the door if it isn’t already open, check the spot (can you find and make it back to the DZ from here? ), and check for traffic. The last item is one that we often see neglected, but it’s a really important one. Usually the pilot will know about any other aircraft in our airspace and will not turn on the red light if another aircraft is in a hazardous spot. However, other pilots don’t always use their radios when they should and/or don’t always have perfectly working radios. So there is always a chance that another aircraft could be trailing your jump plane where you could hit it if you jumped (resulting in a really bad day for everyone). It’s critical to look for such traffic and ask for a go-around if necessary in order to jump into clear airspace. Look down, all around, and especially aft for other traffic flying in the same direction as you before jumping.Also check for other canopies on days when we’re flying multiple planes; you don’t want to jump right on top of anyone! Our aircraft operations should prevent this, BUT stuff happens–premature deployments, accidental handle grabs on group jumps, etc., that could result in a canopy being open in our airspace higher than planned. If canopies are in the landing pattern, they’re low enough that you’re good, but if you see they’re too high or you’re not sure, ask for a go-around or for an instructor to take a look for you. Don’t go until the pilot turns on the green light. There’s usually a good reason why the light isn’t on, and often it has to do with traffic. Likewise, if people are exiting (at any altitude) and the green light is turned off, later groups/jumpers should not exit. There’s a good chance that the spot has gotten poor or a traffic issue has just been identified, and this is the pilot’s way of telling you not to exit. Swinging out from the bar into a back flip: This can scrape off pins on the bottom edge of the door and puts the back of your head at risk of slamming the floor. Safe as long as your rig and head are well clear of the bottom of the door when you pass through it. Hopping out head-down, with your head toward the prop: Safe as long as your rig is well clear of the bottom of the door when you pass through it. Hopping out in an aft-facing sit: Safe as long as your rig is well clear of the front of the door when you pass through it. This is more of a challenge when exiting with another person with grips between you; both of you need to be aware of the door edges and not put your rigs close to them. Diving exit: Safe as long as you don’t scrape your rig along the floater bar/top edge of the door. Floater exit: Safe as long as you keep your rig well clear of the sides of the door when rotating from inside the plane outward to a floating position. If you’re jumping with another person and you’re nearer the front or rear of the door, make sure your rig rotates through the center of the door so it’s as far from the door edges as possible. Don’t hit the tail! This is tough to do in our Super Otter, but much easier to do in a Super Caravan or any other low-tail aircraft. Before exiting, make sure that the plane is configured for your exit (slowed down and not climbing, or not climbing as steeply in the Otter). The pilot will usually slow down and level off dramatically so it is clear that it’s jump run time. 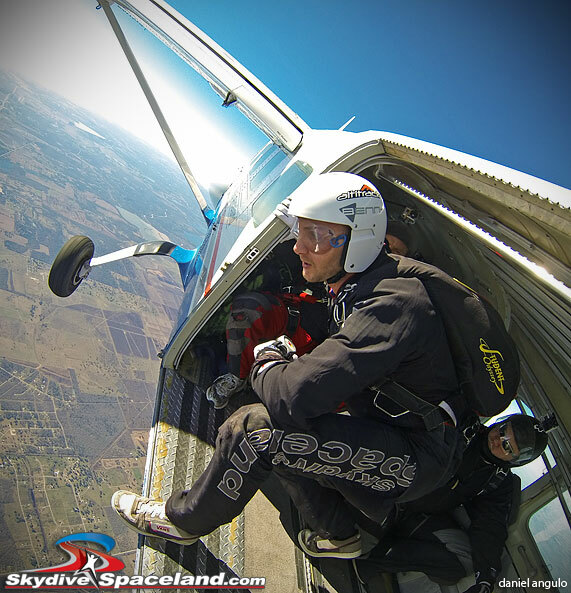 Once it’s time to exit, don’t do a big jump upward off the door and if you’re jumping a wingsuit, keep all wings closed for at least three seconds after exit. Blue skies and safe hops!